Satellite data and ocean sensors show a definite slowdown since 2004 in ocean currents that warm eastern North America and western Europe. The general flow of global ocean circulation. Warm surface currents in red. Cold deep ocean currents in blue. Image via USGS. In the movie The Day after Tomorrow, melting Arctic sea ice disrupts the flow of warm surface currents headed to the North Atlantic, triggering a sudden climatic catastrophe. According to scientists, a sudden catastrophe is very unlikely. But it’s true that places along the northern Atlantic Ocean – eastern North America and western Europe – have milder climates than expected for their latitudes because of ocean currents that carry warm water from the tropics northward. What’s more, a recent study published in the peer-reviewed journal Geophysical Research Letters does indicate that these warm currents have been slowing since at least 2004, confirming a trend suspected before then from spottier data. It doesn’t work like in the movie, of course. The slowdown is actually happening very gradually, but it seems to be happening as predicted: It does seem to be spinning down. Also unlike in the movie, and unlike some theories of long-term climate change, these recent trends are not connected with the melting of the Arctic sea ice and buildup of freshwater near the North Pole. Instead, researchers were surprised to find the slowdown linked to ocean currents off the southern tip of Africa. They think atmospheric conditions are driving this shift in ocean currents. 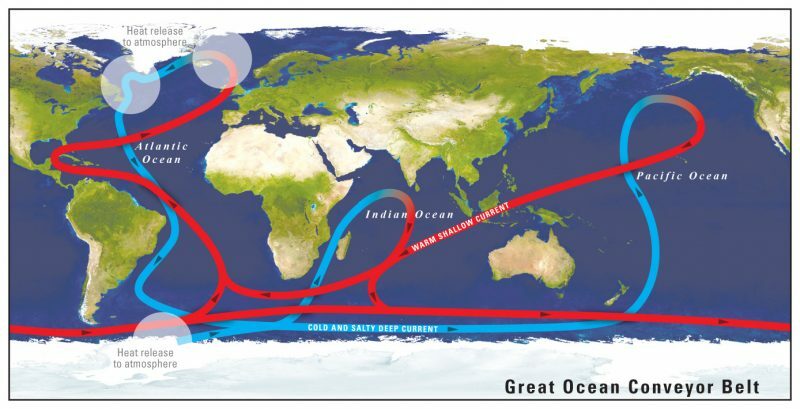 All of Earth’s oceans are interconnected by a global circulation system sometimes called the ocean conveyor belt, and officially known as thermohaline circulation. The global network of ocean currents transports heat from warm equatorial seas to colder polar waters. The system consists of warm surface currents and cold deep ocean currents. The part of the system we in the U.S. and Europe are most concerned about make up what scientists call the Atlantic Overturning Circulation, a network of currents in the Atlantic Ocean. Surface currents carry warm Caribbean waters to the northern Atlantic Ocean where heat is released into the atmosphere, resulting in milder climates in the region. The cooled water sinks to the ocean depths and continues to flow on a southward journey that connects it to other ocean currents. Sensors located in waters off Miami have been monitoring the Atlantic Overturning Circulation for over a decade. That monitoring data, along with satellite data, shows that the currents had definitely been slowing since 2004. Earlier sparser data had also hinted of a slowing trend. Some scientists had theorized that slowing Atlantic Ocean currents could be due to melting Arctic sea ice that releases freshwater into the northern Atlantic. But, according to Kelly and her collaborators, melting Arctic sea ice is not the culprit for the slowdown because, despite the melting ice, Arctic surface water is getting saltier and denser due to lower precipitation. The team, however, did find an unexpected connection to an ocean current system on the other side of the Atlantic, off the southern tip of Africa. The Agulhas Current brings warm Indian Ocean water southward along the African coast and around the tip of Africa, then turns around to connect with southern circumpolar currents around Antarctica. Also, some warm water from the Agulhas Current – known as the Agulhas Leak – enters the Atlantic. We’ve found that the two are connected, but I don’t think we’ve found that one causes the other, It’s more likely that whatever changed the Agulhas changed the whole system. Most people have thought this current should be driven by a salinity change, but maybe it’s the [Southern Ocean] winds. 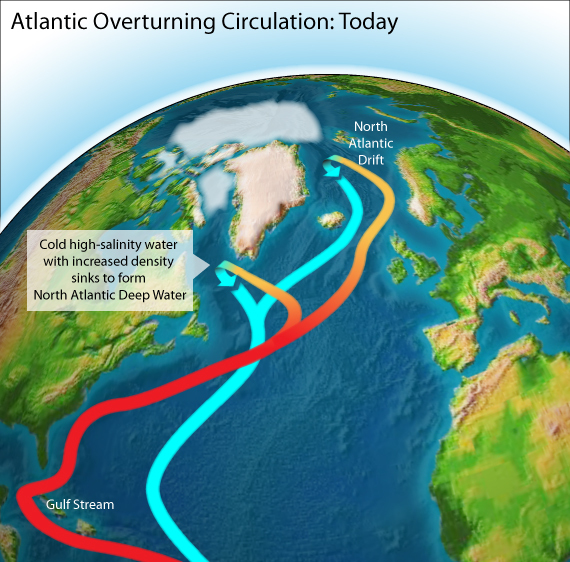 I think it changes how we think about the whole Atlantic overturning circulation, of which the Gulf Stream is a part. It brings back the role of the atmosphere into what’s controlling the climate in the high latitudes, that it’s not all driven by what’s happening in the oceans. 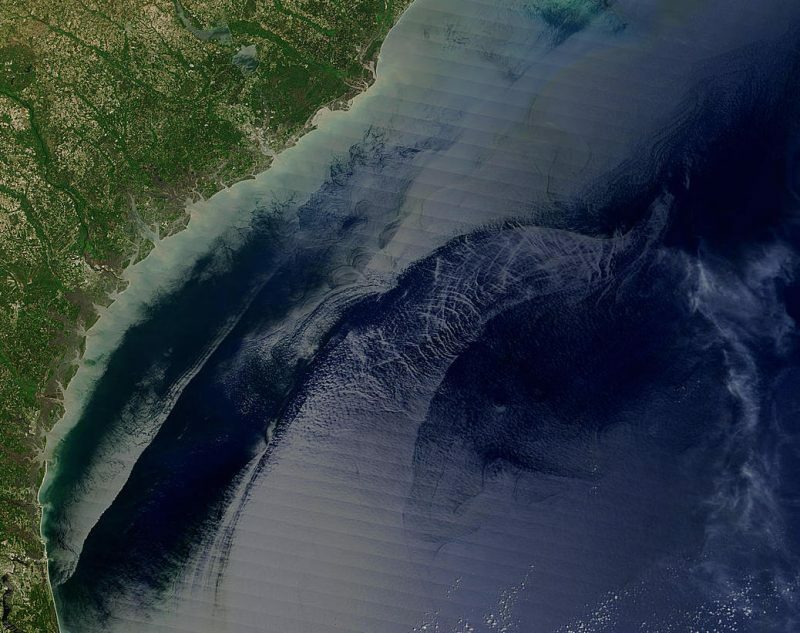 This image, acquired by NASA’s Terra satellite on April 18, 2004, shows the Georgia and Carolinas shoreline. The Gulf Stream is the water feature with a rough sea surface that appears to curve away from the coast. Image via Jacques Descloitres, MODIS Rapid Response Team, NASA/ GSFC. So that whole concept in the movie [The Day after Tomorrow] of New York harbor freezing doesn’t make any sense. If the Gulf Stream doesn’t carry as much heat from the tropics, it just means that the North Atlantic is not going to warm up as fast as the rest of the ocean. It’s not going to cool down. Bottom line: Ocean currents that carry warm water from the tropics to the north Atlantic have been slowing since 2004. Scientists have found that this slowdown is associated with currents off the tip of the African continent, and speculate that both currents are being driven by changes in the atmosphere.